Voters raise their cards to vote on a warrant article. Photo by Mark Robinson Order prints of selected PBP photos. 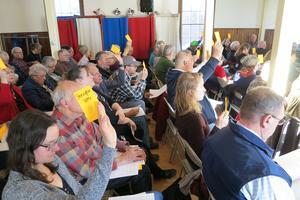 Voters at the annual town meeting Saturday made it clear they want to keep the same amount of police patrols. By about a 2-1 margin they increased the proposed amount for law enforcement by almost $30,000, from $45,440 to $74,800. The lower amount would have funded two additional patrols each week; the higher amount funds three per week, which is what the Sheriff’s Office currently provides. The selectmen had made no recommendation on the amount to be voted on, but had included the lower amount in the budget citing concerns about the effectiveness of the sheriff’s patrols. Don Colson quickly proposed the higher amount and dismissed the idea of going to two days. Robert Ray argued that the officers needed to be patrolling in the downtown area especially in the summer when the population swells. But he supported the additional funds noting that the way things are in the world today, the police presence is important for the safety of the town. Hancock County Sheriff Scott Kane repeated what he had told selectmen: He won’t sign a contract for two days, and without a contract, he can’t guarantee the officers will be available to fill patrol shifts requested by the town. 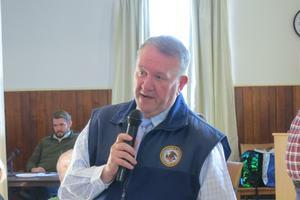 Selectman John Steed challenged the idea that the small increase suggested for the town would really affect how the department could provide coverage to the town. Steed also suggested that times have changed and that Stonington is not “the Wild West” any more. He said that people don’t hang out in large groups in public any more. Kane disputed that and noted that deputies had responded to a call of a large group in Oceanville where there was suspected drug activity. 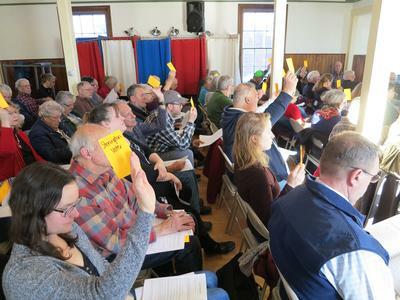 Selectman Donna Brewer said the issue arose because the selectmen had received complaints most of which focused on the static patrols where residents saw deputies parked around town. “People see them just sitting there…and they wonder ‘what are they doing? What are we getting for our money,’” she said. Faced with those complaints, Brewer said, the selectmen considered whether the money could be better spent. Jay Kearney suggested that this really seems to be a question of management and that the selectmen should provide feedback to the sheriff. In a secret ballot vote, residents approved the three-day figure by a vote of 65-28. There was little discussion on the proposal from Fire Chief Ryan Hayward to increase the allocation for the department’s equipment reserve account from $15,000 to $25,000. Hayward said the department has a number of pieces of older equipment that need work. Under the current funding levels, he said, it would be difficult to cover the costs of a major issue on any of that equipment. In addition, Hayward said, the department is looking to the future when it will need to purchase a new fire truck. Voters approved the $25,000 without comment or dissent. They also approved spending $35,000 to make improvements at the Colwell Ramp, despite some grousing about the fact that Isle Au Haut, which jointly owns the public boat launch, has not fully matched the annual allocation for the operation and maintenance of the facility. There was a brief suggestion that Stonington should take some action to force its partner to pay its share. Although Steed agreed that in a perfect world, Isle Au Haut would match Stonington’s contributions, he pointed out that the town of Stonington benefits from having the launch site whether or not Isle au Haut pays. Voters approved both the $35,000 for major improvements and the annual $5,000 allocation. Although there were some questions, voters approved the rest of the warrant articles unchanged, including funding for a new roof at Island Community Center. According to Billings, the two increases that voters approved will raise the municipal budget to $1,710,059. That increase should not have an effect on the tax rate, she said. Selectmen will set the tax rate later this year after the school district holds its annual meeting to adopt a school budget. In voting, Donna Brewer received 75 votes to win another three-year term as selectman. Allison Edinger was elected to a three-year, in-district term on the sanitary district board, while write-in candidate Jeannine Buckminster received four votes to win a three-year at-large term on the district board. Hancock County Sheriff Scott Kane addresses the Stonington town meeting. 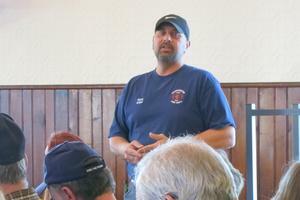 Stonington Fire Chief Ryan Hayward talks about an increase to the department’s equipment reserve fund.